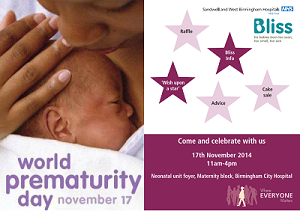 ON Monday 17th November 2014, Sandwell and West Birmingham Hospitals NHS Trust is throwing open the doors to its neonatal unit to mark World Prematurity Day. Working to provide the best possible care and support for all premature and sick babies and their families, UK charity Bliss is behind World Prematurity Day which aims to publicise the fact that every year around the world 15 million babies are born too soon, with 80,000 being admitted to special care in the UK each year. The Neonatal Unit at Birmingham City Hospital is hosting a full day event to celebrate the day by raising parents’ awareness of premature birth and to introduce the services and support that the hospital offers parents and their babies. Corrine Dacosta, Intensive Care sister in the Neonatal Unit, came up with the idea and explained: “We’re offering a range of activities, including talks from doctors, nurses, midwives and parents about premature birth, a cake sale and competition to raise funds to purchase more equipment, a raffle with a host of exciting prizes and a demonstration of how a tiny baby is taken care of in an incubator. “I personally went through the experience of giving birth to a premature baby. My baby was born at 27 weeks and had to stay at the unit for more than six months. During that time, I was inspired by the care that the staff delivered and decided to change my career path from theatres to neonates. I’ve never looked back. “It is very important to help parents to be well prepared when they have premature babies. On the unit, we have a range of different services to help parents take care of their babies, including how to breastfeed their babies, provide assistance with feeding, bathing and change nappies.